Enter the race number to be added. If no number is required enter ‘none‘. Select the number style that you require. Click on image to view in larger size. Enter the race name to be added. If no number is required enter ‘none‘. Select the name style that you require. Click on image to view in larger size. If you would like any further customisation to your order please add this information here. Would you like to see a proof prior to printing? If so, please bear in mind this can often add at least a working day to your order, as we would require approval from yourself prior to printing. Proofs are emailed to the email address provided during checkout. Please check your spam/junk folders just incase. 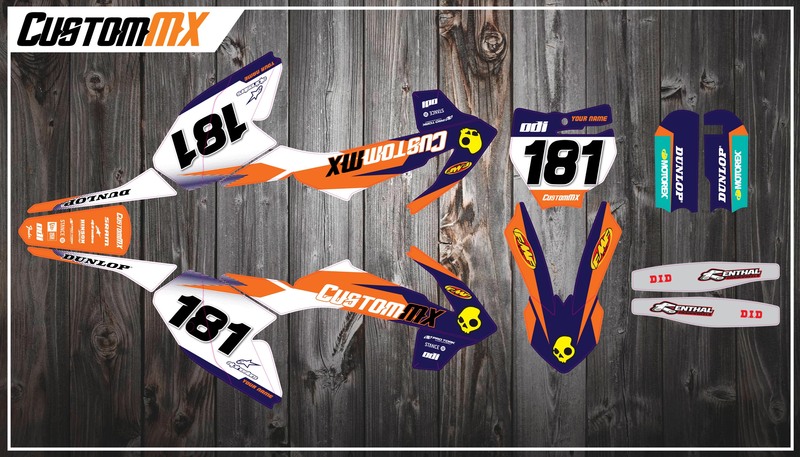 Our full motocross kits can be customised with your name and number, as well as your choice of industry logo’s (excluding Red Bull, Monster Energy and KTM) where required. Colours are shown as an example, but the colours can be modified to suit, please provide this information when placing your order.